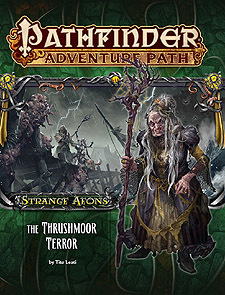 "The Thrushmoor Terror," a Pathfinder adventure for 4th-level characters, by Tito Leati. A gazetteer of the dreary town of Thrushmoor, the setting for the events of this adventure, by Tito Leati. A look at the nihilistic cult of the Great Old One Hastur, by James Jacobs. Horror on the plains in the Pathfinder's Journal, by Christopher Rowe. A bestiary containing a new Great Old One and other accursed monsters, by James Jacobs, Michelle Jones, and Tito Leati.